A bombing in the Somali capital of Mogadishu (file photo). 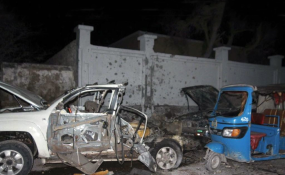 "Following the mortar attack on the UN compound in Mogadishu on 1 January 2019, the Designated Official for Somalia has decided, as a precautionary measure, to limit the staffing footprint in Mogadishu for the immediate future" a letter signed by Clark Toes OiC UNSOS said.
" Some personnel who were scheduled to travel to Somalia on Sunday 6 January have been directed to temporary remain in Nairobi. Some who are scheduled to travel on Monday 7 January will be individually contacted and directed to temporarily remain in Nairobi" it added. "This measure applies only to personnel assigned to Mogadishu, and not to those in duty stations in the sectors and regions. MovCon colleagues will vet the manifest during check-in in Nairobi, and those who have been asked to remain will not be checked in. Those who do not receive any notification should proceed to Mogadishu as planned" the letter said. "Individuals who have been instructed to remain in Nairobi are required to report for duty, and to work from the UNSOM or UNSOS office in Nairobi. They will be considered as being on official business travel status, and entitled to daily subsistence allowance in Nairobi, on the condition that they report daily to the Nairobi Office. They should register with the colleagues in Human Resources Management Section below upon arrival at the office in Nairobi, so that work spaces can be identified for them".